The ladies in our bible study hosted a fun shower for a Mommy-to-be today. I found the "b is for...." theme over at Hostess with the Mostess. This is such an awesome site for all things party related. Our friend, Mary Jo, with What's Inside Designs pulled together this amazing invitation. I asked Mary Jo for a few extra cards with the "b" for display purposes. She sent so many that I used them to make the favors too. Thanks Mary Jo!! I covered a cork board with some vintage pink chenille then pinned each card to the board. The button candy mold came from Bake It Pretty. Of course, we pulled together some tasty treats for our little brunch. With Bellinis, Bubbly (sparkling punch), and brew to sip on. My cake was nearly a disaster. I managed to salvage it enough to serve, but you only get to view the top. I'm a bit embarrassed by the rest. After deciding on the theme, I found this cute bee fabric at JoAnn's. Amy Butler's pattern from the Little Stitches for Little Ones book worked out perfect for this one. We can't wait to meet the beautiful baby girl!! The shower stuff looks so great! I love the theme!!! 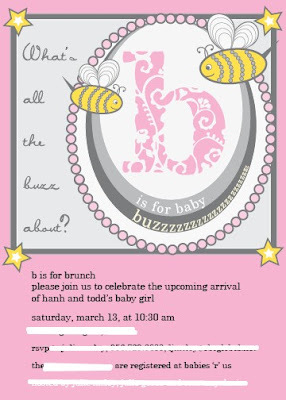 I just came across your blog, I love this baby shower Idea and the little dress that you made is tooo cute.